taken on a dry fly. Spaniel work is alive and well on New Zealand’s newest Pheasant Preserve. In New Zealand sporting circles, the name Poronui has long held high regard. It is known among hunters as the original liberation point of the Sika Deer in New Zealand and known to anglers as a base for superb trout fishing. The eight-point Sika Buck is now, arguably, the most sought after big game trophy in "Aotearoa" (the Maori name for New Zealand meaning "land of the long white cloud") and the trout draws anglers from the world over. There were several attempted liberations of Sika deer in the new English colony of New Zealand during the late 1800’s. However, it was the gift of three Manchurian stags and three does by the Duke of Bedford, from his Woburn Park estate, that established the herd in the Central North Island region - where Poronui lies right in the heart. "Springers are the most suitable dog for the scrubby terrain..."
In a similar time frame, stocks of brown trout from the English chalk streams and rainbow trout from the west coast of the US were made into the streams surrounding - and on - Poronui. The generations of wild trout that followed these successful liberations remain the principle attractant of international visitors to Poronui, even to this day. 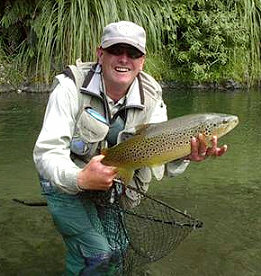 Poronui is known as the number one destination for sportsmen in pursuit of the finest quality trout fishing in the world. In the streams that are on and surround the 16,000 acre property, wild brown and rainbow trout rise freely to the dryfly. The peak summer months see anglers testing their skill against trout that have grown out of all proportion to the fish of their homelands.